When Reggie Fils-Aime said that there was only one way to really experience the 3DS, I had a little heart palpitation that we'd be getting to take home the console to try it out for ourselves. Unfortunately, that wasn't the case, but we were able to hold the device and get a taste of what handheld 3D gaming is all about. 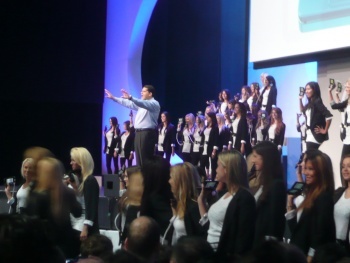 The line of lovely ladies holding the 3DS with a power source strapped onto their midsection was a little intimidating. Still, I was excited to get my hands on it and I wasn't going to let residual nerd shyness prevent that. Holding the 3DS feels like most handheld gaming; the device isn't any heavier than a standard DSi and the buttons and controls are spread out nicely. The 3D slider was a nice touch; you could clearly adjust the depth of field from 2D to maximum 3D goodness. Unfortunately, there was no actual gameplay, just a demonstration of what 3D graphics can do. The quick demo cycled through various popular Nintendo franchises, and I was able to tilt and pan the camera using the new input: the slide pad. It was a true 3D view, without the annoying glasses, just as Reggie said it would be. Mario and company all atop a huge Bowser popped out of the screen and it seemed like I could grab them. The final section of the demo was the best-looking. Link, in all his green elfin glory, was shown on a burning orange background. The sword thrusts and swings that he performed truly popped, but my favorite detail was the ash streaming around him. It was out of focus and it slowly drifted off screen, which I think aptly showed just how much detail handheld 3D is capable of. It was no Avatar but it was close. The amount of features on the 3DS is impressive. I wish I could have tried out the 3D snapshots that the two camera lenses will provide, and the motion sensor and gyroscope will allow game designers to really play with as many user inputs as possible. 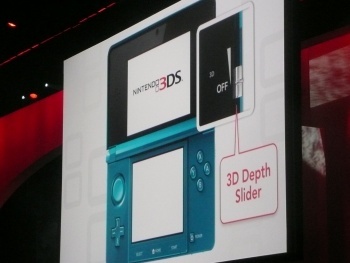 The demo did not display these features, but the fidelity of the 3D images it did show leaves me optimistic that the 3DS is the future of handhelds, if not 3D gaming as a whole.